Our collection of Spring quotes might find you inspired after a reading. Spring is the most awaited season of the year. It is a heavenly respite from the harsh, dark winter. It is when nature enters into its festival mode. Spring is the time of renewal, rebirth, greenery, and life sprouting all around. Gardeners love spring, for it gives them more light and the pleasant warmth to go out and sow the seeds. As temperatures increase, both flora and fauna get a long awaited relief from the cold winter. Spring is the season of love. It is the season of increased productivity. It is a season when you find yourself intoxicated with the unknown elixir of life that makes living a better experience. 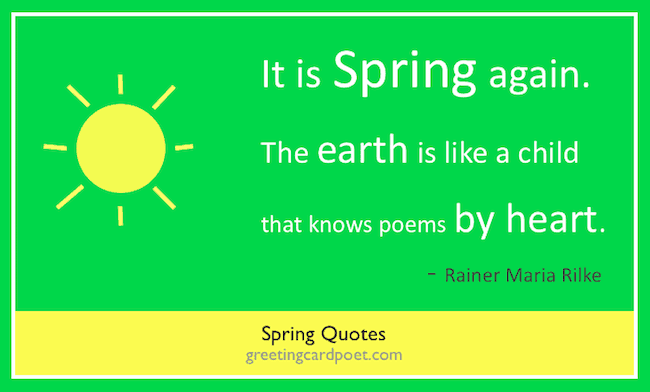 if you do not sing or recite a lovely poem during Spring, you probably feel like it. Here are some famous and beautiful spring quotes you can find a lot of inspiration in. With spring around the corner, it’s time to spread love and care. And, hopefully one of these sayings will mean something special to you, a friend or a loved one. In Spring, everything is full of promise…. The child sporting upon the lawn, and the season, sympathize together, and nature rejoices in her virgin loveliness. Never cut a tree down in the wintertime. Never make a negative decision in the low time -Never make your most important decisions when you are in your worst moods. Wait. Be patient. The storm will pass. The spring will come. It’s time for a spring cleaning of your thoughts, it’s time to stop to just existing it’s time to start living. I look forward to spring cleaning and putting things in their place. It’s therapeutic for me. The key to spring cleaning is to be ruthless! Throw out anything and everything you never use. Forgive and set yourself free. When we forgive, we heal our own anger and hurt and are able to let love lead again. It’s like spring cleaning for our heart. Apologizing is like spring cleaning. If spring came but once a century instead of once a year, or burst forth with the sound of an earthquake and not in silence, what wonder and expectation there would be in all hearts to behold the miraculous change. Spring is the only revolutionary whose revolution has succeeded. A life without love is like a year without spring. I would have made more of an effort to enjoy spring if I’d known it was only going to last 3 days. Fantastic! Right in the middle of that long stretch between Christmas and Spring Break, your coats are getting dirty, everything’s dark, dingy – what a great time for a movie! Spring indicates what God can do with a dreary and grimy world. It’s the first day of spring. That means this weekend I’ll take down my Christmas lights. I love spring anywhere, but if I could choose I would always greet in a garden. The sun was warm but the wind was chill. You know how it is with an April day. ascended from the fantasies of its frigid rest.